Spišská Sobota, the most picturesque part of Poprad, was added to the town in 1946. The oldest settlement of the area, it occupies a favourable position at the busy crossroads of Via Magna trade route and the road connecting the Kingdom of Hungary and Poland. The first reference to it is found in a deed of gift by King Bela IV from 1256, directly indicating the existence of Saturday fairs in the town. However, later references to its new name Mons Sancti Georgii from 1271 and 1273 reflect the arrival of German settlers in Spiš after the Tatar invasion of 1241-1242. In 1380 King Louis I codified the right to run weekly markets on Saturdays. This town function is demonstrated by the lens-shaped square which has preserved its medieval appearance thanks to the unchanged way of life and appearance of the built-up area. In 1413 the King included Spišská Sobota and 13 Spiš towns in a pledge to the Polish King Vladislav. Thereafter, although legally the towns remained a part of the Kingdom of Hungary, from an administrative point of view they had to defer to Poland for almost 360 years. The subsequent economic boom in the town resulted in much building activity during the second half of the 15th century and throughout the 16th century. The Catholic Church of St George, originally built in the Romanesque style, was reconstructed by builder Juraj Steinmetz. 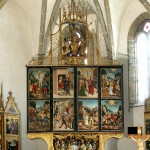 Its main altar of St George was made in the workshop of Master Pavol of Levoča. The church tower was built after a great fire in 1545. 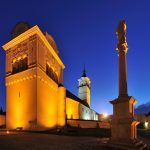 A separate bell tower was built in place of an older wooden building in 1598 and in the mid 18th century it was rebuilt in its present-day Baroque form. A row of two-storey stone burgher houses and one-storey craftsmens’ and tanners’ houses (the latter sometimes made of clay) built on narrow plots and bordering the square originate from the 15th-16th centuries. The back walls of outbuildings on the other side of plots were connected in a continuous row and formed a substitute for fortifications. Entries into the town were locked by storey gates. These gates were pulled down during the 19th century. Characteristic protruding wooden gutters conveyed rain water from the deep valleys of the saddle roofs with their gables and cornices. A large mansard roof built from 1638 to 1640 stands out from the row of houses behind the parish church. Burghers completed a permanent road leading to Poprad and built an arched bridge made of stone above the river. In the centre of the square the representative Renaissance Town Hall was built on older foundations in 1547. Its facade underwent modifications at the end of the 18th century. Burghers established a city aqueduct as early as 1575. A plague epidemic left its mark on the town at the start of the 18th century. The gradual decline of trade resulted in a crisis that impacted negatively on the town’s prosperity, and a fire that broke out immediately after the town had been returned from the pledge also contributed to its decay. The Marian column, erected on the square in 1772, commemorates the return of the town after the pledge. In 1813 an earthquake damaged some buildings, including the interior of the Church of St George. A cemetery at the church was removed in the 19th century and a park was founded in the decaying market square. The advent of capitalism resulted in the establishment of several small factories. However, the Košice-Bohumín railway line, opened in 1871, bypassed the town completely, confirming its decline, and by 1923 Spišská Sobota had lost the dominant position it had once enjoyed. In recent years the town has enjoyed something of a revival thanks to the growth of tourism. Several small guest-houses and restaurants draw from its unique history. Spišská Sobota was declared as the Town Conservation Reservation in 1950 thanks to the extraordinary preservation of its unique built-up area and architectural and town planning values.